Stephanie Ruiz, left, comforted Nancy Garcia, whose mother, Aura Garcia, was crushed to death on the Andrew McArdle bridge. Aura Garcia lived just around the corner from the Meridian Street bridge, a two-lane drawbridge over the Chelsea River. Usually the East Boston resident took the bus to Chelsea on the other side. But on Tuesday, Garcia walked. She never made it across the span. Authorities said she was killed after the bridge started to rise while she was on it. As she screamed for help, the bridge operator began to lower it again. But by then Garcia had fallen, and the descending bridge came down on top of her, crushing her. Mourners Wednesday placed teddy bears, flowers, and candles at the bridge. Some, weeping inconsolably, left notes: “Rest in Paradise!! !” read one. “You will be missed,’’ said another. Garcia’s death on New Year’s Eve has left her family confounded and grief stricken — and demanding answers. At the bridge in bitter cold Wednesday, her 16-year-old daughter, Nancy Garcia, wept. “Mama! Mama! Mama!,’’ she moaned into the shoulders of her childhood friend Stephanie Ruiz, as they stood at a makeshift memorial on the bridge. “How could this happen? How could he not see her?” Ruiz said of the bridge operator. Police said the bridge operator has been cooperating with authorities, and city officials are examining what kind of warnings are issued to pedestrians before the bridge is raised. Police homicide detectives also plan to review surveillance video on the bridge in hopes of determining exactly how the tragedy occurred. 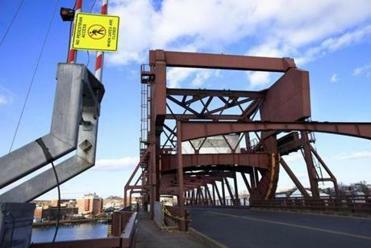 It unfolded midday Tuesday, as 46-year-old Aura “Laura” Garcia left her East Boston apartment and began walking across the bridge, also known as Andrew McArdle Bridge. She was going to an appointment at Massachusetts General Hospital and had planned to return home about 2 p.m., so she and her children could go to Roxbury to mark the new year with relatives, her daughter said. Garcia had a disability, was overweight and walked slowly, so she may have been taking her time to cross the bridge, friends and family said. “She used to walk slowly because she didn’t like people rushing her,’’ Ruiz said. At some point along the way, the bridge began to rise to allow a boat to pass. A woman on the Chelsea side of the bridge at the time of the accident said she heard a loud foghorn and saw blinking lights before the bridge began to open and then heard frantic screams. Police said Garcia clung to the bridge as it rose and dangled over the cold water below. Fire officials said that at some point she fell to a concrete structure near the base of the bridge. Aura Garcia was crushed to death Tuesday as she tried to walk across the Andrew McArdle Bridge linking East Boston and Chelsea. On Wednesday, a somber stream of friends of relatives mourned Aura Garcia. Outside the massive apartment complex where she lived, family members asked for privacy. A sister in Roxbury reached by phone sobbed. By the bridge, a woman who said she was a close, long-time friend of Aura Garcia’s struggled for words. “She was my friend,’’ she said, with tears welling. Many who recalled Garcia, said she was a devoted mother, a trusted friend, a kind-hearted person. Ruiz, 19, said she lived with Garcia and her family and that Garcia practically raised her. 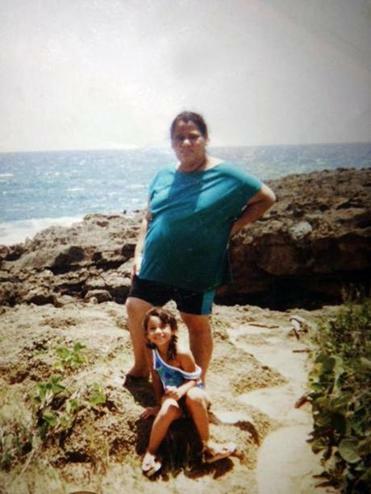 “She was not like an aunt to me, she was like my mother,’’ Ruiz said. Nancy Garcia said her mother was born in Guatemala and married her father, Daniel, in Puerto Rico, where he is from. The couple also had a son, Daniel, now 4. Eventually Garcia and Daniel separated, though he lives nearby. Sitting at the dining table of her family’s apartment Tuesday morning, the East Boston High School student pulled out her cellphone and scanned photos of her mother. “She was beautiful to me,’’ she said. She recalled the two sitting together at the table eating Chinese food on Monday. The next morning, her mother came into Nancy’s room to borrow a hairbrush. Groggy from sleep, the daughter said she only saw the back of her mother’s head as she was leaving the room.